This document contains requirements for the development of an XML Processing Model and Language, which are intended to describe and specify the processing relationships between XML resources. This First Public Working Draft has been produced by the W3C XML Processing Model Working Group as part of the XML Activity, following the procedures set out for the W3C Process. The goals of the XML Processing Model Working Group are discussed in its charter. Comments on this document should be sent to the W3C mailing list public-xml-processing-model-comments@w3.org (archive). A large and growing set of specifications describe processes operating on XML documents. Many applications will depend on the use of more than one of these specifications. Considering how implementations of these specifications might interact raises many issues related to interoperability. This specification contains requirements on an XML Pipeline Language for the description of XML process interactions in order to address these issues. This specification is concerned with the conceptual model of XML process interactions, the language for the description of these interactions, and the inputs and outputs of the overall process. This specification is not generally concerned with the implementations of actual XML processes participating in these interactions. An XML Information Set or "Infoset" is the name we give to any implementation of a data model for XML which supports the vocabulary as defined by the XML Information Set recommendation [xml-infoset-rec]. An XML Pipeline is a conceptualization of a flow of a configuration of steps and their parameters. The XML Pipeline defines a process in terms of order, dependencies, or iteration of steps over XML information sets. A pipeline specification document is an XML document that described an XML pipeline. A step is a specification of how a component is used in a pipeline that includes inputs, outputs, and parameters. A component is an particular XML technology (e.g. XInclude, XML Schema Validity Assessment, XSLT, XQuery, etc.). An XML infoset that is an input to a XML Pipeline or Step. The result of processing by an XML Pipeline or Step. A parameter is input to a Step or an XML Pipeline in addition to the Input and Output Document(s) that it may access. Parameters are most often simple, scalar values such as integers, booleans, and URIs, and they are most often named, but neither of these conditions is mandatory. That is, we do not (at this time) constrain the range of values a parameter may hold, nor do we (at this time) forbid a Step from accepting anonymous parameters. 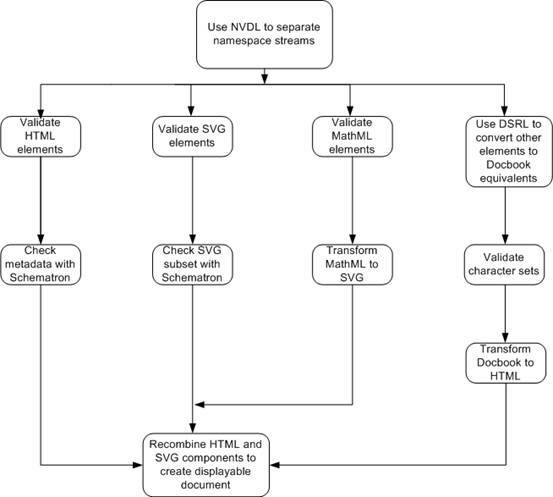 The technology or platform environment in which the XML Pipeline is used (e.g. command-line, web servers, editors, browsers, embedded applications, etc.). The ability to parse an XML document and pass infoitems between components without building a full document information set. The design principles described in this document are requirements whose compliance with is an overall goal for the specification. It is not necessarily the case that a specific feature meets the requirement. Instead, it should be viewed that the whole set of specifications related to this requirements document meet that overall goal specified in the design principle. Applications should be free to implement XML processing using appropriate technologies such as SAX, DOM, or other infoset representations. Application computing platforms should not be limited to any particular class of platforms such as clients, servers, distributed computing infrastructures, etc. In addition, the resulting specifications should not be swayed by the specifics of use in those platform. The language should be as small and simple as practical. It should be "small" in the sense that simple processing should be able to stated in a compact way and "simple" in the sense the specification of more complex processing steps do not require arduous specification steps in the XML Pipeline Specification Document. At a minimum, an XML document is represented and manipulated as an XML Information Set. The use of supersets, augmented information sets, or data models that can be represented or conceptualized as information sets should be allowed, and in some instances, encouraged (e.g. for the XPath 2.0 Data Model). It should be relatively easy to implement a conforming implementation of the language but it should also be possible to build a sophisticated implementation that implements its own optimizations and integrates with other technologies. An XML Pipeline must be able to be exchanged between different software systems with a minimum expectation of the same result for the pipeline given that the XML Pipeline Environment is the same. A reasonable resolution to platform differences for binding or serialization of resulting infosets should be expected to be address by this specification or by re-use of existing specifications. The XML Pipeline Specification Document should be able to be validated by both W3C XML Schema and RelaxNG. XML Pipelines need to support existing XML specifications and reuse common design patterns from within them. In addition, there must be support for the use of future specifications as much as possible. The specification should allow use any component technology that can consume or produce XML Information Sets. An XML Pipeline must allow control over specifying both the inputs and outputs of any process within the pipeline. This applies to the inputs and outputs of both the XML Pipeline and its containing steps. It should also allow for the case where there might be multiple inputs and outputs. An XML Pipeline must allow control the explicit and implicit handling of the flow of documents between steps. When errors occur, these must be able to be handled explicitly to allow alternate courses of action within the XML Pipeline. There must be a minimal inventory of components defined by the specification that are required to be supported to facilitate interoperability of XML Pipelines. Mechanisms for XML Pipeline composition for re-use or re-purposing must be provided within the XML Pipeline Specification Document. XML Pipelines should allow iteration of a specific set of steps over a collection of documents and or elements within a document. XML Pipelines must support the XPath 2.0 Data Model to allow support for XPath 2.0, XSLT 2.0, and XQuery as steps. At this point, there is no consensus in the working group that minimal conforming implementations are required to support the XPath 2.0 Data Model. This section contains a set of use cases that support our requirements and will inform our design. While there is a want to address all the use cases listed in this document, in the end, the first version of those specifications may not solve all the following use cases. Those unsolved use cases may be address in future versions of those specifications. The above table is known to be incomplete and will be completed in a later draft. Retrieve a document containing XInclude instructions. Locate documents to be included. Return a single XML document. Validate with Relax NG, possibly aborting if not valid. Validate with W3C XML Schema, possibly aborting if not valid. Locate a collection of documents to aggregate. Perform aggregation under a new document element. Save the HTML file using HTML serialization. Read a list of source documents. Perform a series of XSLT transformations. Alternatively, aggregate the resulting documents and serialize a single result. Extract MathML fragments from an XHTML document and render them as images. Employ an SVG renderer for SVG glyphs embedded in the MathML. Process an XML document through XInclude. Transform the result with XSLT using a fixed transformation. Digitally sign the result with XML Signatures. Remove any xml:base attributes anywhere in the resulting document. Schema validate the document with a fixed schema. For all elements or attributes whose type is xs:anyURI, resolve the value against the base URI to create an absolute URI. Replace the value in the document with the resulting absolute URI. This example assumes preservation of infoset ([base URI]) and PSVI ([type definition]) properties from step to step. Also, there is no way to reorder these steps as the schema doesn't accept xml:base attributes but the expansion requires xs:anyURI typed values. Execute XSLT transformation on that document. Return the XML document from persistence service (new XForms instance) as the HTTP response body. Parse the incoming XML request. Construct a URL to a REST-style web service at the NOAA (see website). Parse the resulting invalid HTML document with by translating and fixing the HTML to make it XHTML (e.g. use TagSoup or tidy). Extract the tide information from a plain-text table of data from document by applying a regular expression and creating markup from the matches. Use XQuery to select the high and low tides. Formulate an XML response from that tide information. Gather the text children of the 'description' element. Parse the contents with a simulated document element in the XHTML namespace. Send the resulting children as the children of the 'description element. Apply rest of pipeline steps. Generate a new child as a text children containing the contents (escaped text). In XQuery and XSLT 2.0 there is the idea of an input and output collection and a pipeline must be able to consume or produce collections of documents both as inputs or outputs of steps as well as whole pipelines. Accept a collection of documents. Apply a single XSLT 2.0 transformation that processes the collection and produces another collection. Serialize the collection to files or URIs. Accept a single document as input. Apply an XQuery that produces a sequence of documents (a collection). Receive XML request with word to complete. Call a sub-pipeline that retrieves list of completions for that word. Format resulting document with XSLT. Dynamically create an XQuery query using XSLT, based on input XML document. Execute the XQuery against a database. Construct an XHTML result page using XSLT from the result of the query. Read a CSV file and convert it to XML. Process the document with XSLT. Convert the result to a CSV format using text serialization. Receive an XML document to save. Check the database to see if the document exists. If the document exists, update the document. If the document does not exists, add the document. Receive an XML document to format. If the document is XHTML, apply a theme via XSLT and serialize as HTML. If the document is XSL-FO, apply an XSL FO processor to produce PDF. Otherwise, serialize the document as XML. If the configuration is "desktop browser", apply desktop XSLT and serialize as HTML. If the configuration is "mobile browser", apply mobile XSLT and serialize as XHTML. Receive an XML document in Atom format. If the configuration is "RSS 1.0", apply "Atom to RSS 1.0" XSLT. If the configuration is "RSS 2.0", apply "Atom to RSS 2.0" XSLT. Serialize the document as XML. Validate the XML-RPC request with a RelaxNG schema. Dispatch to different sub-pipelines depending on the content of /methodCall/methodName. Format the sub-pipeline response to XML-RPC format via XSLT. Validate the XML-RPC response with an W3C XML Schema. Call a sub-pipeline to insert content into a relational or XML database. Produce a list of files in the directory as an XML document. Create an iTQL query using XSLT. Query the repository to check if the file has been uploaded. Inspect the file to check the metadata type. Transform the document with XSLT. Make a SOAP call to ingest the document. Call a SOAP service with metadata format as a parameter. Create an iTQL query with XSLT. Query a repository for the XML document. Load a list of XSLT transformations from a configuration. Iteratively execute the XSLT transformations. Serialize the result to XML. An non-XML document is fed into the process. That input is converted into a well-formed XML document. A table of contents is extracted. Each page is transformed into some output language. Select a MathML content element. For that element, apply a computation (e.g. compute the kernel of a matrix). Replace the input MathML with the output of the computation. This document provides a test scenario that will be used to create validation management scripts using a range of existing techniques, including those used for program compilation, etc. Use ISO 19757-4 Namespace-based Validation Dispatching Language (NVDL) to split out the parts of the document that are encoded using HTML, SVG and MathML from the bulk of the document, whose tags are defined using a user-defined set of markup tags. Validate the HTML elements and attributes using the HTML 4.0 DTD (W3C XML DTD). Use a set of Schematron rules stored in check-metadata.xml to ensure that the metadata of the HTML elements defined using Dublin Core semantics conform to the information in the document about the document's title and subtitle, author, encoding type, etc. Validate the SVG components of the file using the standard W3C schema provided in the SVG 1.2 specification. Use the Schematron rules defined in SVG-subset.xml to ensure that the SVG file only uses those features of SVG that are valid for the particular SVG viewer available to the system. Validate the MathML components using the latest version of the MathML schema (defined in RELAX-NG) to ensure that all maths fragments are valid. The schema will make use the datatype definitions in check-maths.xml to validate the contents of specific elements. Use MathML-SVG.xslt to transform the MathML segments to displayable SVG and replace each MathML fragment with its SVG equivalent. Use the ISO 19757-8 Document Schema Renaming Language (DSRL) definitions in convert-mynames.xml to convert the tags in the local nameset to the form that can be used to validate the remaining part of the document using docbook.dtd. Use the IS0 19757-7 Character Repertoire Definition Language (CRDL) rules defined in mycharacter-checks.xml to validate that the correct character sets have been used for text identified as being Greek and Cyrillic. Convert the Docbook tags to HTML so that they can be displayed in a web browser using the docbook-html.xslt transformation rules. Limiting the transform to a subtree of the document identified by an XPath. For each subtree, cache the subtree and build a whole document with the identified element as the document element and then run a transform to replace that subtree in the original document. For any non-matches, the document remains the same and "streams" around the transform. This allows the transform and the tree building to be limited to a small subtree and the rest of the process to stream. As such, an arbitrarily large document can be processed in a bounded amount of memory. Matching the head and body elements using a XPath expression that can be streamed. Inserting a stub for a transformation for including the style and surrounding navigation of the site. For each of the stubs, transformations insert the markup using a subtree expansion that allows the rest of the document to stream. In the end, the pipeline allows arbitrarily large XHTML document to be processed with a near-constant cost. A step in a pipeline produces multiple output documents. In XSLT 2.0, this is a standard feature of all XSLT 2.0 processors. In XSLT 1.0, this is not standard. A pipeline author wants to write a pipeline that, at compile-time, the implementation chooses XSLT 2.0 when possible and degrades to XSLT 1.0 when XSLT 2.0 is not supported. In the case of XSLT 1.0, the step will use XSLT extensions to support the multiple output documents--which again may fail. Fortunately, the XSLT 1.0 transformation can be written to test for this. As the final step in a pipeline, XQuery is required to be run. If the XQuery step is not available, the compilation of the pipeline needs to fail. Here the pipeline author has chosen that the pipeline must not run if XQuery is not available.